Aar Maanta is a Somali-British singer, songwriter, producer, and actor. Aar Maanta spent his early years in Somalia, but on the eve of the civil war in the early 1990’s, he moved to the UK. Some describe his music as “afro-hop”:afro because it’s African music and hop because it hops among Somali styles and such genres as jazz, reggae, and house music. His is the music and the voice of a new generation. 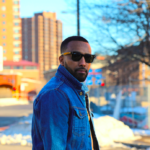 “Aar Maanta aims to make music that reaches uprooted Somalis, which addresses the unique issues of those living outside of their homeland” (MPR News). His international touring band includes Italian bass player Ruth Goller, British/South African saxophonist Josh Cutler, French guitarist Thibaut Remy, and Nepalese/Scottish drummer Pharoah Smeaton Russell.